With all the attention paid to building up your pecs, your front delts are probably quite formed too. Plus to further the illusion of a small waist, you are probably doing all kinds of middle-delt moves. Your rear delts, the ones you can’t see in the mirror, are so underdeveloped that you’d a need a microscope to spot them, this is what we need to focus on. 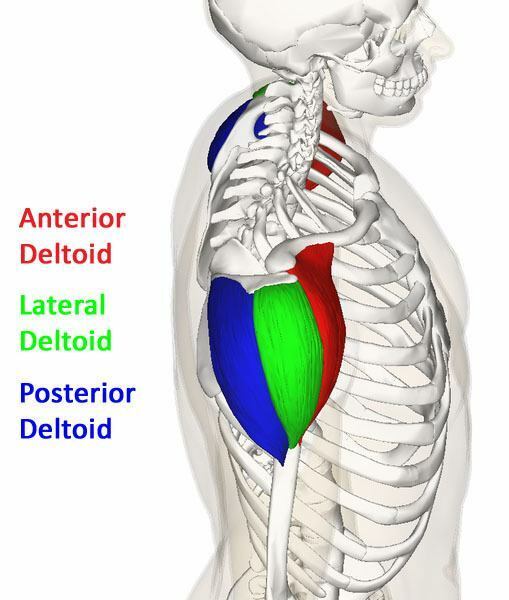 Imbalance among the three deltoid heads can lead to significant rotatory cuff problems. Those front caps are likely pulling your shoulders forward, which is perfect if you want to have a bad posture and walk hunched and uncomfortable. To start, you’re going to have to abandon the ”what-you-can’t-see-in-the-mirror-can’t-hurt-you school of training”. You will need to start adding dedicated exercises and make strategic decisions about how to increase the mass in your rear delts. Whether it’s a stubborn area by nature or just lack of training, these eight tips will help you balance and prioritise your delts. This is one of those items bodybuilders know about but few less-experienced understand because often they’re preoccupied with segmenting workouts purely by body part. It’s important to know that many back exercises (particularly rows) actively engage the rear delts, just as chest training pulls in the front delts and triceps, back training recruits the biceps, some shoulder exercises work the upper traps and other back exercises work the lower and middle traps. Think about how you do reverse flyes on the pec deck machine. Now bend over; this motion isn’t dissimilar to how you do bent-over rows or T-bar rows supported against a bench. They hit the middle traps, rhomboids and rear delts quite well. That’s why it’s important to remember that many exercises, especially multi joint ones, are not good at isolating particular muscle groups. Multi joint exercises recruit a number of secondary, assistance muscles. Many rowing motions do just that with the rear delts. If you’re doing back and shoulders on consecutive days in the gym, you’re probably not giving your rear delts enough rest between workouts. You’ll want to separate those training days by at least 48 hours. Try this rowing programme and see how it really pushes those delts! You can also double up your rear-delt workouts (not your entire shoulder workouts) over the course of your training split. As long as you work enough rest days in and pay attention not to train back and shoulders on consecutive days, this approach can work because the rear delt isn’t a particularly large head. Rather than duplicating the rear-delt exercises you do in each of your workouts, the better approach would be to vary them. In addition to exercise choice and equipment, you can create variety through rep ranges, intensity-boosting techniques, volume ranges and rest periods. For optimal results, try manipulating several variables so that the rear delts are being worked in multiple ways. The delt head that you work first, when your energy levels are highest, is the one that will improve the fastest. I’m not asking you to ditch the overhead press. But because that exercise does a much better job building the front and middle delts, depending on whether you lower the bar in front of or behind your head, you need to hit your rear delts immediately after to bring them up. One option is to do a rear-delt single-joint isolation exercise before working the middle and front delts. This way, the rear delts get the priority among the single-joint movements after you do your presses. Another alternative is to take a pre-exhaust approach and do a single-joint rear-delt move first, before the multi joint pressing move. You might sacrifice a bit of strength on your presses but you’ll be strong enough to attack those rear delts. Like all single-joint straight-arm raises involving the delts, keeping your elbow locked with a very slight bend throughout the range of motion is critical. On movements like standing cable reverse flyes, many lifters extend their elbows as they press the handles away, but that turns the movement into a triceps exercise. Practice locking a slight bend in your elbows and holding it there. If you’re still having trouble, do the movement on the pec deck machine, which better locks your elbows in the correct position. Single-joint exercises are not the best mass-builders, but you can at least use the best of the batch. The bent-over dumbbell lateral raise, which generates a bit of momentum through your lower body, is one of your best options. You also need to pick the right rep range. Never go too heavy with single-joint exercises, as they can put undue pressure on a joint. Choosing a weight at which you fail on the lower side of the 8-10-rep range is a solid muscle-building option. Just make sure you take each set to muscle failure—the point at which you can’t complete any more reps using good form. No limits for you to just a single isolation movement for rear delts, so hit them again in the same workout. You just don’t want to work them in the exact same manner, so choice of equipment and rep target become important. One-arm bent-over cable lateral raise. Incline bench bent-over dumbbell lateral raise. Head-supported bent-over dumbbell lateral raise. If you’ve got only one or two go-to rear-delt exercises in your gym bag, it’stime for a bigger bag. Learning new movements can instill a novel stimulus and jump start growth. 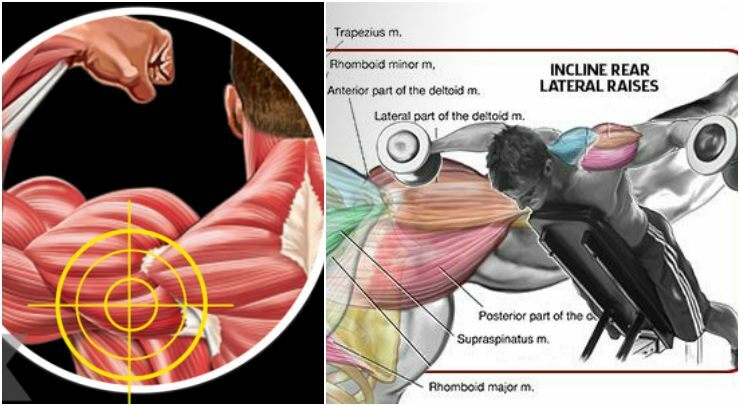 Rear delts can typically be isolated with machines, cables and dumbbells. Unilateral (one-arm) versions allow greater range of motion and intensity. Get creative. With dumbbells while standing in the bent-over position. Seated on a flat bench. With your head pressed into a bench to reduce body English. On an incline bench set to about 60 degrees. Also consider making slight adjustments to your existing exercises. Changing the angle of pull on cable exercises is as easy as moving the pin, and it allows you to slightly alter the recruitment pattern among the muscle fibres. Drop-sets: Really easy to do with dumbbells, machines, or any cable exercise. Simply reduce the weight by about 25% when you reach muscle failure and immediately resume the set, working to a second point of muscle failure. You always want to finish your workout, no matter the body part, feeling you gave it your all. Some of these advanced techniques might do just that, but don’t be afraid to experiment. Grab a pair of dumbbells and sit at the end of a flat bench. Bend over and complete a set of seated bent-over lateral raises to failure (adjust the weight so that you reach failure at about 10 reps). But instead of ending your set here, you’re going to now introduce a bit of body English to enable you to continue the set. Immediately get off the bench and do the same exercise from the standing, bent-over position. Because you’re able to generate a bit of momentum through your knees and hips, you can keep the set going, intensifying the burn. If you still want to up the ante, by all means add a drop-set to the end of that. So go ahead: Pick and choose among these strategies to boost your rear-delt development.